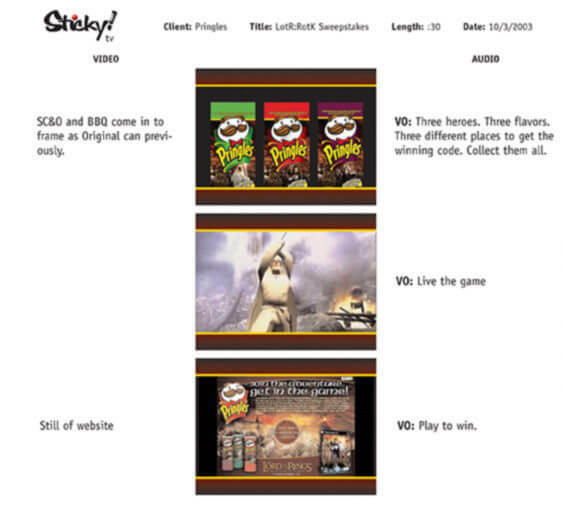 Pringles, seeking a high profile entertainment tie-in to generate retail customer excitement and incremental display, asked Stafford & Malone to research, identify, negotiate and execute a promotional partnership with a top motion picture property. 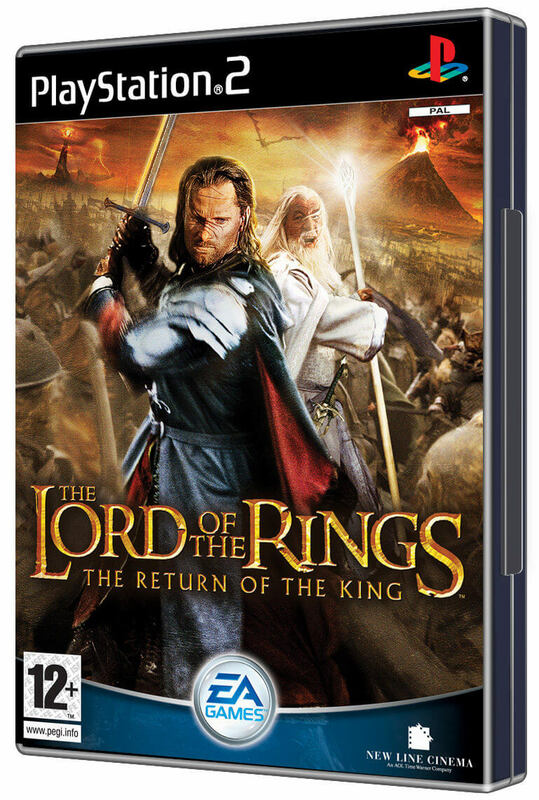 Stafford recommended The Lord of the Rings: Return of the King. 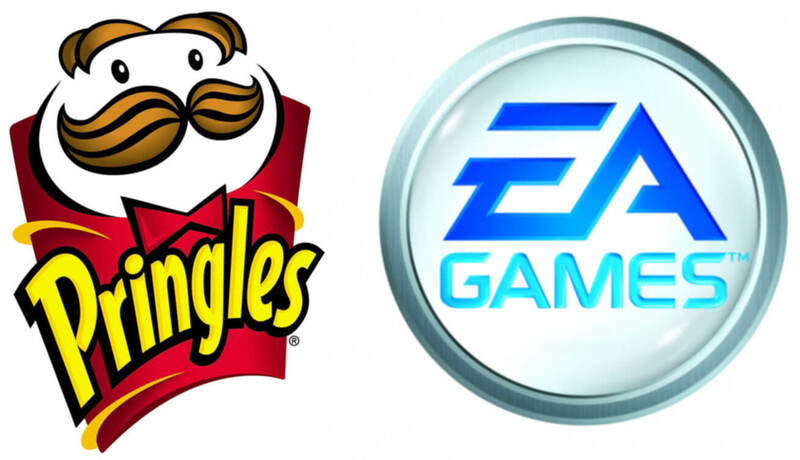 Utilizing his extensive contacts in the studio and video game industries, Stafford created the partnership between Pringles, New Line Cinema and Electronic Arts for a Holiday 2003 promotion. 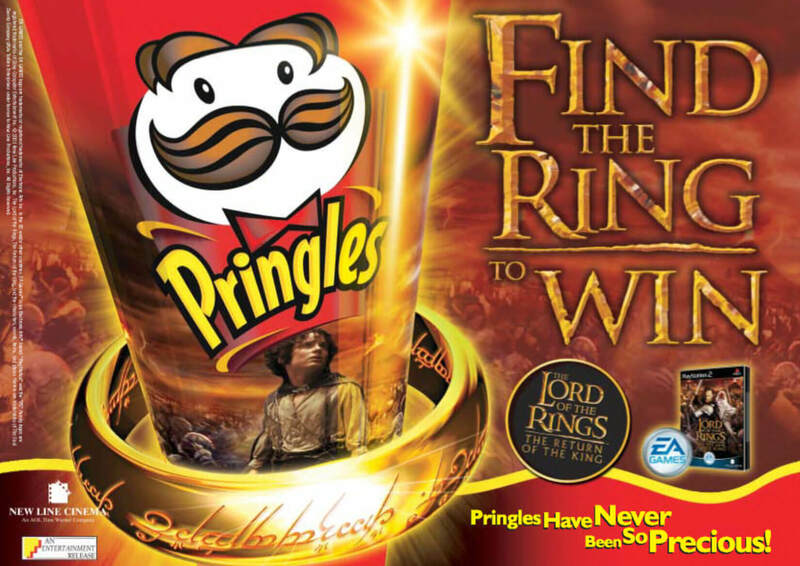 This was Pringles first ever national on-pack promotion in North America (U.S. & Canada) and Pringles became a partner of the most successful film franchise of all time. 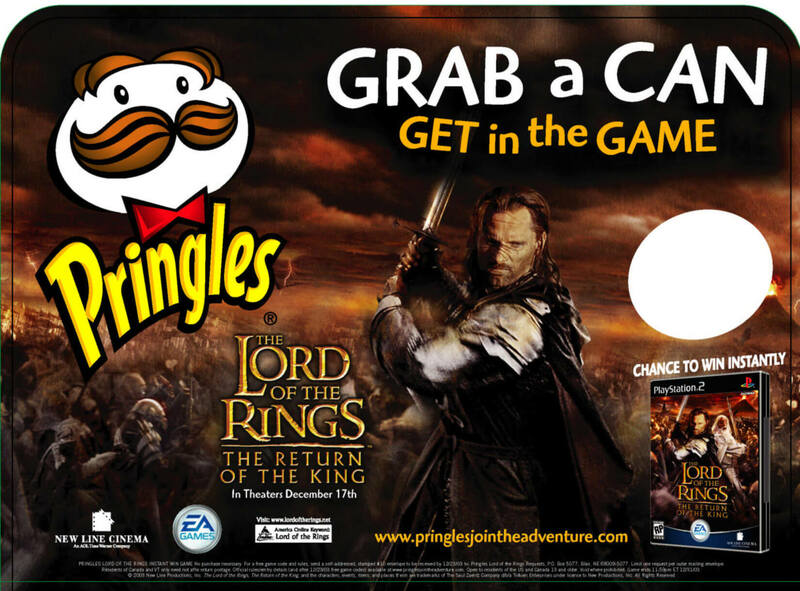 To drive repeat purchase, Stafford built the Create your own Fellowship Sweepstakes whereby consumers who purchased Pringles entered a special code from the can (using the new thermal chromatic technology) on the promo website, thereby registering themselves plus 8 friends for a chance to win a trip to Hollywood for an exclusive celebrity screening of the Lord of the Rings trilogy. The promotion asked consumers to input friends names and e-mail addresses to create their own fellowship. Each friend was sent an e-mail invitation to join the promotion. The viral nature of the promotion was ideal for the highly loyal film fan base. 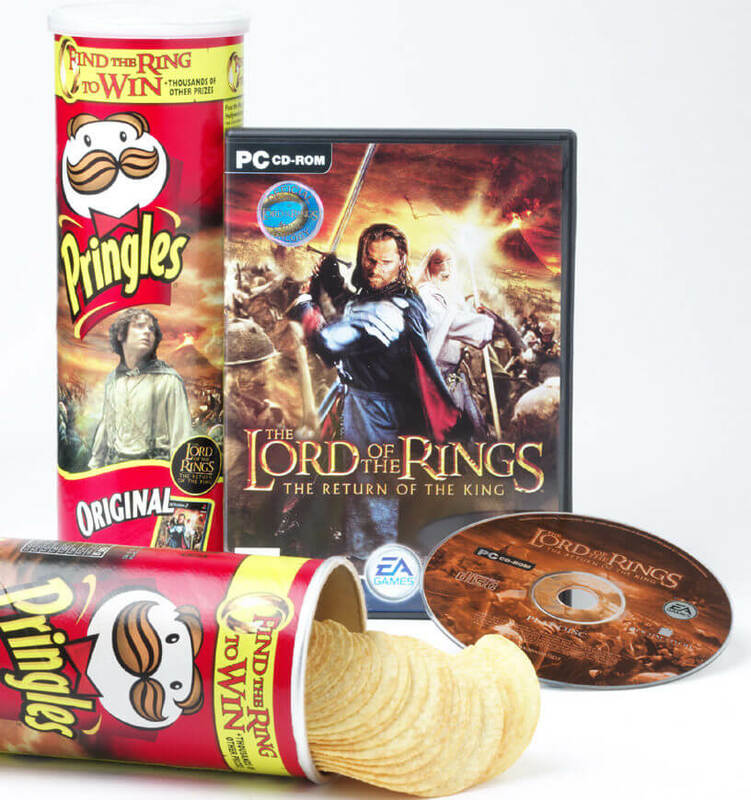 The grand prizewinner also had his image and likeness captured and digitized and was integrated into the Lord of the Rings video game by EA (2004). 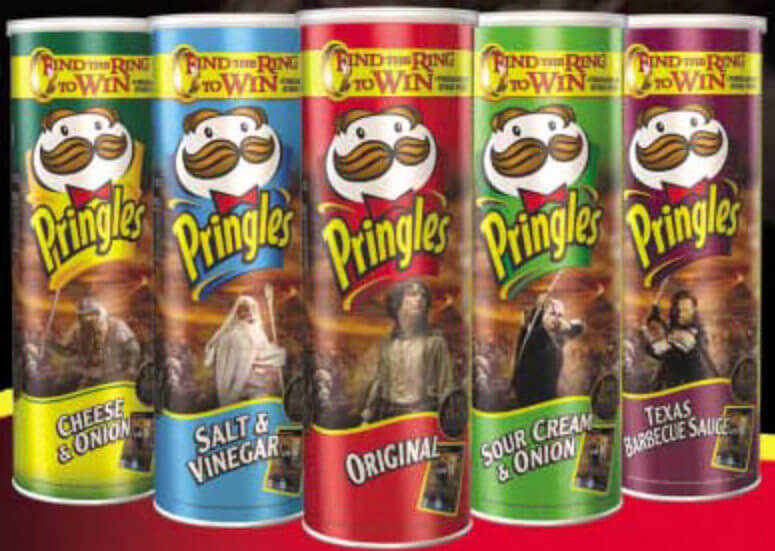 This promotion was the first national promotion by Pringles. 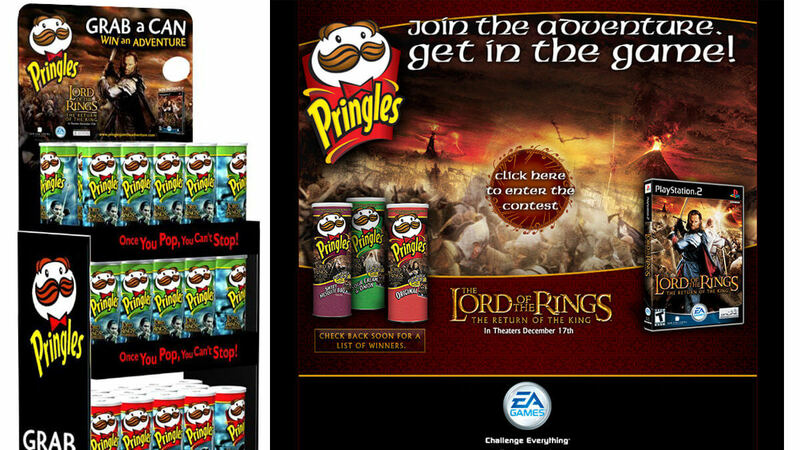 After delivering multiple presentations with the P&G Wal*Mart customer team to the Wal*Mart snacks buyer, including promotional tie-in’s with properties like James Bond, Hulk and EA Games, Wal-Mart still hesitated on buying into a Pringles tier 1 promotion. This led Stafford to recommend a ‘Build it and they will come’ strategy. 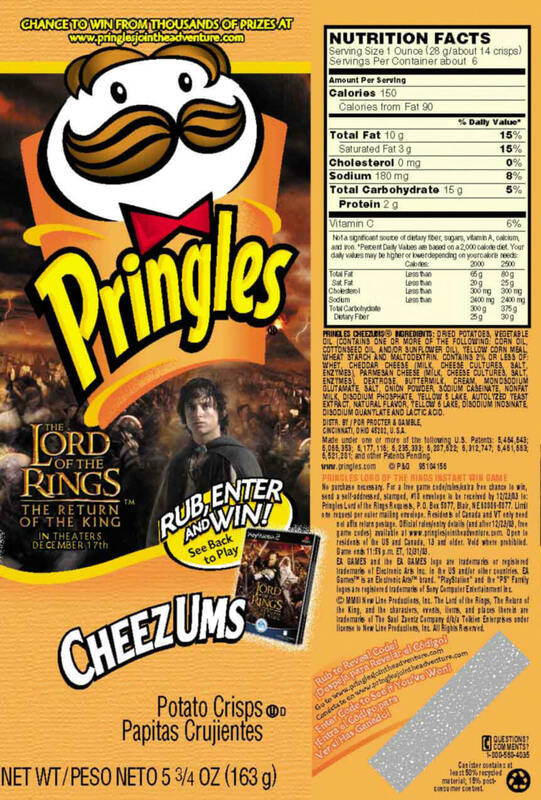 After securing the partnership and building the promotion, Stafford offered Wal*Mart an exclusive Pringles Lord of the Rings Return of the King collector can with Frodo. No other retailer would carry the marquee character in the franchise. 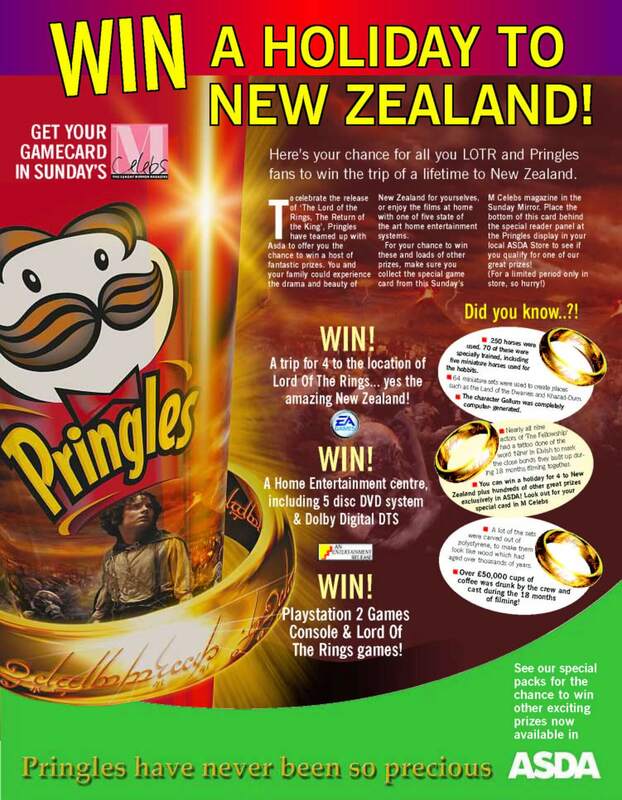 Winners were treated to an exclusive visit to Hollywood including site seeing, exclusive ROTK gift packs and a viewing of the entire Lord of the Rings Trilogy courtesy of Pringles, EA and New Line Cinema. Both U.S. and European winners (Fellowships) attended. 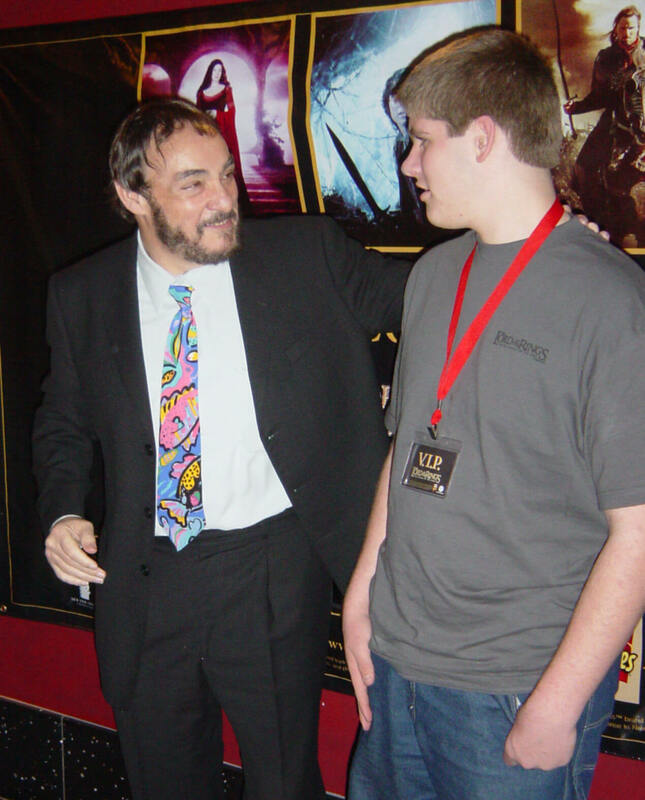 The celebrity guest was John Rhys-Davies (Gimli). 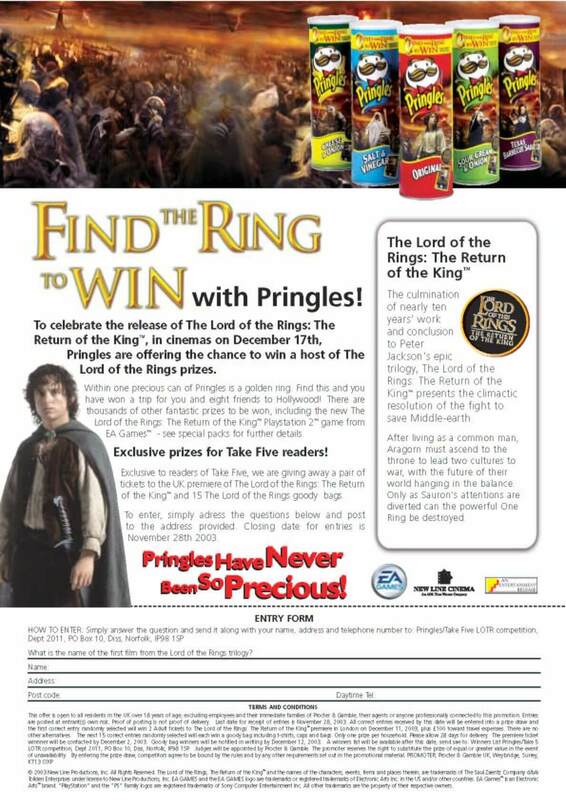 For the European promotion Stafford created the Find the Ring to Win Sweepstakes. 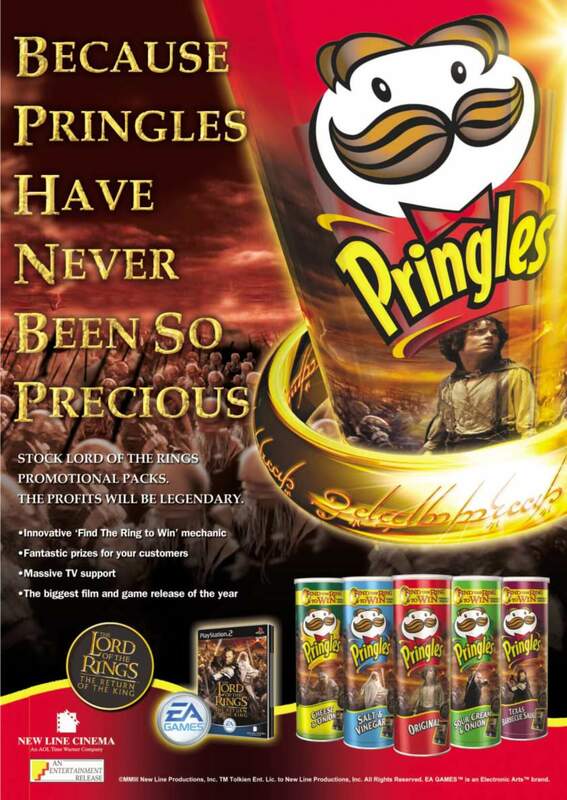 In each of the Pringles collectors cans (with the addition of the Gimli character) consumers had the chance to find the golden Lord of the Rings. This was a physical golden ring which the grand-prize winner could wear. The winner of the grand-prize also received a trip for 8 friends to the grand-prize celebrity event in Hollywood. The key customer overlay was for ASDA, Wal*Mart’s owned and operated chain in Britain & Ireland. 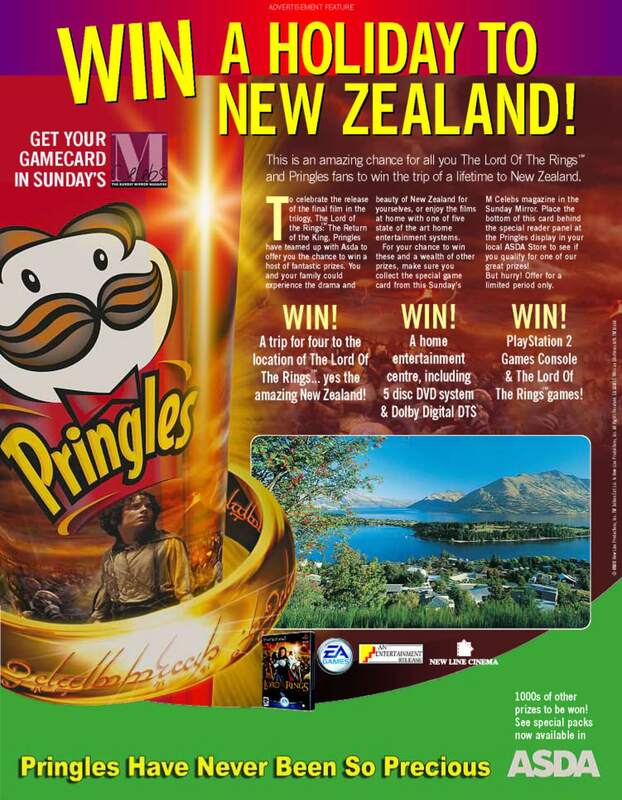 ASDA ran a massive overlay promotion, Win a Trip to New Zealand in partnership with the Daily Mirror newspaper. 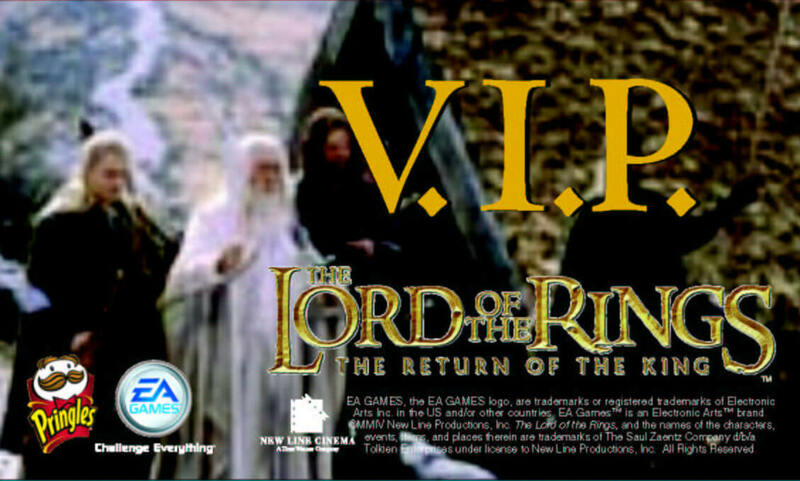 Consumers received a special game card insert in the Daily Mirror which they took into ASDA and scanned under a special ‘reveal light’ technology incorporated into the end-cap display. If they were a winner game cards revealed the prize. © MMIII New Line Productions, Inc. 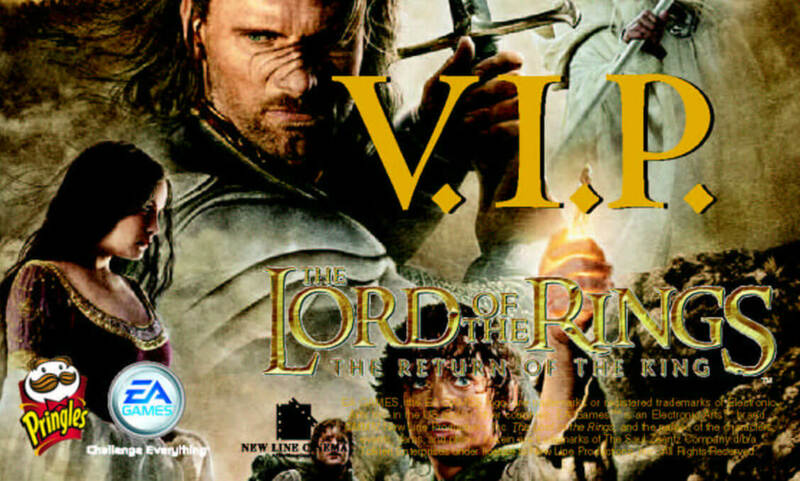 The Lord of the Rings™, The Return of the King, and the characters, events, items, and places therein are trademarks of the SAUL ZAENTZ Company d/b/a Tolkien Enterprises under license to New Line Productions, Inc.